Woohoo! I am finally getting these posted and I think I'm finally feeling better after an over week long battle of what my neurologist says are "complex migraines!" Believe me I don't wish them on anyone! 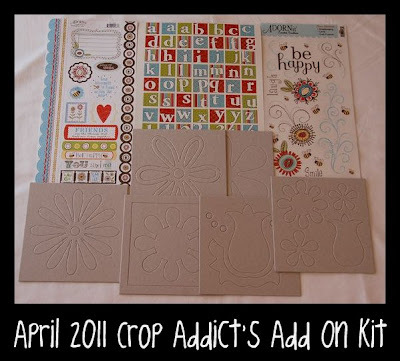 This April Kit was so fun to play with that is available at Crop Addict right now. This is a picture of Jeremy and my husband. Jeremy had been stung by a bee a few days ago. He cried so hard and just kept saying Mommy, it hurts! Poor little thing! So, when Craig went out and was mowing the lawn, he got stung twice. We had to assure Jeremy that Daddy was OK and almost make a joke of it because he almost started crying again. It melted my heart to see that at almost 4 he had developed empathy. This is also of Jeremy when we went white water rafting last summer. I still can't believe how brave he was. Because I sure wouldn't do it! NO way!!! This card I made with my bazzill cardstock that I cut my scallops out of for my Bee Happy Layout! The scallop sticker is also scraps from my A Fun Spring Day Layout! Again, this is made from the bazzill cardstock that I cut the scallop out of. I also stamped it with the stamp that is in the kit. The color of this card looks a little wonky, but I wanted you to be able to see the stamping. 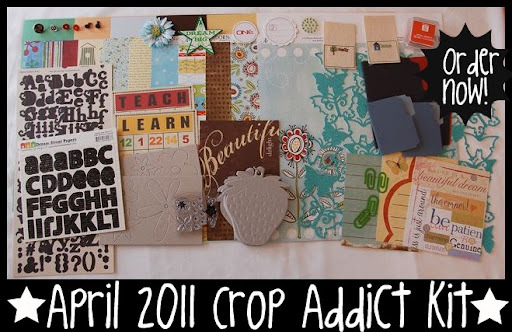 Megan, another DT Member at Crop Addict always creates these amazing two page layouts! So, I was bound and determined that I was going to do it this month. This paper in the kit is perfect for it because it fits together. When I l ook at these pictures and the title I made, I kind of laugh! Since we have our winter coats on. It really was spring, but it was freezing outside. Here's some pics of the fabulous kit for April! Here's the links again to go and grab the April Kit at the store! Hope you have a scrap happy weekend! what fun lo's i especially love the first one. awesome!